For the first time, Sears sold complete houses, including the plans and instructions for construction of 22 different styles, announcing that the featured homes were “complete, ready for occupancy.” By 1911, Modern Homes catalogs included illustrations of house interiors, which provided homeowners with blueprints for furnishing the houses with Sears appliances and fixtures. Over that time Sears designed 447 different housing styles, from the elaborate multistory Ivanhoe, with its elegant French doors and art glass windows, to the simpler Goldenrod, which served as a quaint, three-room and no-bath cottage for summer vacationers. (An outhouse could be purchased separately for Goldenrod and similar cottage dwellers.) Customers could choose a house to suit their individual tastes and budgets. Individuals could even design their own homes and submit the blueprints to Sears, which would then ship off the appropriate precut and fitted materials, putting the home owner in full creative control. Modern Home customers had the freedom to build their own dream houses, and Sears helped realize these dreams through quality custom design and favorable financing. 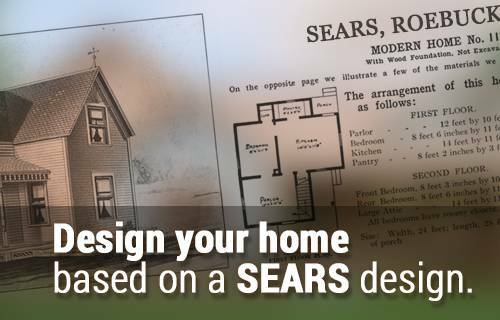 The process of designing your Sears house began as soon as the Modern Homes catalog arrived at your doorstep. Buyers could reverse a floor plan, add a dormer, or even chose brick instead of wood siding. All of this and more are possible, because the Modern Homes program encouraged custom designing houses down to the color of the cabinetry hardware. Sears was not an innovator in home design or construction techniques; however, Modern Home designs did offer distinct advantages over other construction methods. The ability to mass-produce the materials used in Sears homes lessened manufacturing costs, which lowered purchase costs for customers. Not only did precut and fitted materials shrink construction time up to 40% but Sears’s use of “balloon style” framing, drywall, and asphalt shingles greatly eased construction for homebuyers. “Balloon style” framing. These framing systems did not require a team of skilled carpenters, as previous methods did. Balloon frames were built faster and generally only required one carpenter. This system uses precut timber of mostly standard 2x4s and 2x8s for framing. Precut timber, fitted pieces, and the convenience of having everything, including the nails, shipped by railroad directly to the customer added greatly to the popularity of this framing style. Sears helped popularize the latest technology available to modern homebuyers in the early part of the twentieth century. Central heating, indoor plumbing, and electricity were all new developments in home design that Modern Homes incorporated, although not all of the homes were designed with these conveniences. Central heating not only improved the livability of homes with little insulation but it also improved fire safety, always a worry in an era where open flames threatened houses and whole cities, in the case of the Chicago Fire. Indoor plumbing and homes wired for electricity were the first steps to modern kitchens and bathrooms. Sears Modern Homes program stayed abreast of any technology that could ease the lives of its homebuyers and gave them the option to design their homes with modern convenience in mind. No official tally exists of the number of Sears mail-order houses that still survive today. The keen interest evoked in current homebuyers, architectural historians, and enthusiasts of American culture indicate that thousands of these houses survive in varying degrees of condition and original appearance. The American landscape is dotted by Sears Modern Homes. Few of the original buyers and builders remain to tell the excitement they felt when traveling to greet their new house at the train station. The remaining homes, however, stand as testaments today to that bygone era and to the pride of home built by more than 100,000 Sears customers and fostered by the Modern Homes program. At Express Modular, you don’t receive a kit and then have to assemble your entire home. Today a paper catalog has been replaced with the Internet and your computer. And your modular home will comes 80-90% complete and can be fully customized using today’s latest building technologies. Please take a look at our 100’s of Standard Plans or even Design Your Own Plan. If you have any questions please contact a Modular Home Consultant. How many homes were sold through Sears's mail-order Modern Homes program between 1908 and 1940? It is reported that more than 100,000 houses were sold between 1908 and 1940 through Sears’s mail-order Modern Homes program! Sears and Roebuck pioneered the process of buying your home from a catalog and even customizing the home to the customers tastes and needs. While Express Modular doesn’t make you wait at the train station today to meet your home, our customers still feel that same level of excitement. The anticipation of having their new modular home delivered to their building site and watching as a crane assembles their custom home before their eyes is almost overwhelming for some.